Whimbrel Nature: An Overreaction to "Overreacting"
Clicking through brings me to a blog post by Rick Wright entitled "Overreacting" about a recent controversy involving the ID of an Ontario oriole. The bird was visually identified as a female Bullock's oriole but genetic testing after later rescuing the bird revealed Baltimore oriole mitochondrial DNA (meaning the bird was some level of hybrid). While I don't disagree with his general point; that we often think of "species" as inviolate when there can actually be quite a bit of genetic mixing in many cases, another general pronouncement about birding and science also demanded my attention. "For the past century and a quarter, birding in North America has been intentionally cast as an exercise in identification of species. If we want to keep understanding birding in that way — and many of us do — we have to both acknowledge and insist on the difference between what we do and what the scientists do. Our tools are our eyes and our minds, not blenders and litmus paper." 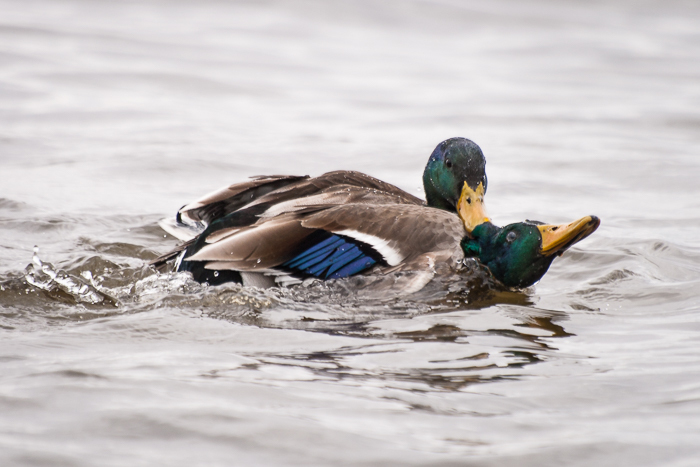 Yes, these mallard drakes may very well have black duck DNA running through their veins. Does it diminish my appreciation of their beauty? Does it diminish my joy in watching their late winter and early spring breeding displays and antics? Not a bit. And maybe that's the problem with "listing". If scientists decided tomorrow that those two species have interbred enough to become one, would I bemoan the loss of a check mark on my "life list?" No, I would be honored to witness ongoing evolution, or scientific progress, or both. I would still cherish all the memories of watching their behavior. I would value this new information I had about their biology. All way better experiences than check marks on a piece of paper. First off, mirroring Rick's honesty at the beginning of his post, I must disclose that I am a scientist, and I actually even, very briefly, played one on TV (Episode 8). However, I was a "birder" first, and back then, when I was in high school, we were only just becoming uncomfortable calling ourselves "bird watchers." These days if you look at my use of time, I'd consider myself a photographer first, a scientist second, a science educator third, and a birder fourth (but maybe not in the sense that Mr. Wright considers a birder). I think encouraging distance between "science" and "birding" is the wrong thing to do. Even to suggest that science and modern birding are incompatible is dangerous. Particularly at a time when tools like eBird mean that birders are poised to make greater contributions to science and bird conservation than ever before. Historically birding has been intimately intertwined with science and it is on the cusp of being even more connected. I take exception with two aspects Mr. Wright's argument. First that science can ruin or be a detriment to birding, and second that birding is primarily "an exercise in identification of species". In the first case, I'm reminded of a quote by Richard Feynman, the famous physicist. He is discussing an argument he frequently has with his artist friend, who regarding a flower says, "I as an artist can see how beautiful this is but you as a scientist take this all apart and it becomes a dull thing." Feynman goes on to argue that while it may be less aesthetically refined, that outer beauty is accessible and appreciated by him too, but that he is not limited to that dimension, that through science he can also picture the beauty of the flower at smaller dimensions; the cells and associated processes. He then goes on to envision evolutionary processes, which leads to questions about the aesthetic senses of other animals. He concludes by saying the following. "All kinds of interesting questions which the science knowledge only adds to the excitement, the mystery and the awe of a flower. It only adds. I don’t understand how it subtracts." This is how I feel about science; it only adds to birding, never detracts. Ultimately our goal in birding should be getting to know birds better, both individually and in general. Science only adds to this process. Let's take the oriole in question. The genetic test that revealed Baltimore oriole DNA gives us new information regarding that individual. We now understand her a bit better. Even if we only care about identification, the science has added more accurate information, which should be our goal in identification. We now know that she is some form of hybrid. But it also adds questions. How much of a genetic hybrid is she? What is her lineage? Did she come from the hybrid zone or is she a genetically mixed individual that was living further east, or further west? How much of a vagrant is she? Perhaps we should read up on the hybridization of Bullock's and Baltimore orioles and understand why they are still considered two species. The mystery and beauty surrounding this bird has increased. We've learned more about this individual and have been motivated to seek out more information about these species and their biology. Science has added value to this bird and the experience of seeing her. My second objection is to the statement that birding is primarily focused on identification and listing. While these days I'm not exactly in the constant company of the birding elite, I know lots and lots of birders and bird enthusiasts that would object to this characterization. Many birders devote much of their birding time to citizen science initiatives such as the Christmas Bird Count and Breeding Bird Surveys. Legions of bird enthusiasts are perfectly happy to enjoy mostly the birds that occur on their feeders or in their own backyard. Many birders refuse to chase vagrants and rarities for both ethical, biological, and more practical reasons. Most birders are anxious to go beyond just identification and eagerly devour information on behavior, conservation, habitat associations, and history. In fact the most interesting question about the Ontario Bullock's vs. Baltimore oriole, is not whether folks should count it on their life list or not. It's why that even matters in this day and age of birding. By seeing a bird once, how much do we really know about it? What is so gosh darned important about seeing it, particularly when it is somewhere it doesn't usually occur. How much value is added to the world? How much value is added to our own personal knowledge and experience? A late friend and mentor, owl bander Patrick Matheny, was fond of telling me that listing was child's play and that he kept a "F**K list". Species that he had seen copulating. While obviously somewhat tongue-in-cheek, still species-based, and meant to mock "listers," he had a point. What's so impressive about seeing (and hopefully correctly identifying) a bird? Observing a species copulating would at the minimum take a lot more luck. And if you really wanted to build your list, you'd have to go to the birds' native ranges, you'd have to spend a lot more time with them, you would have to learn the timing of their breeding season, and you'd have understand a lot more about their biology and behavior. Now that would be impressive! Don't get me wrong. I don't see anything wrong with keeping your own personal life list. I don't see anything wrong with doing a big day or even a big year, like Noah Strycker. There's just so much more to birding. Take the figure below. 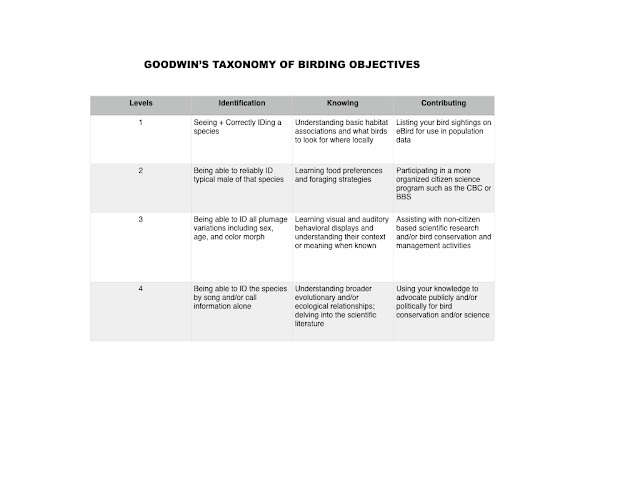 For lack of a better name (and/or modesty) let's call it Goodwin's Taxonomy Of Birding Objectives (loosely based on Bloom's Taxonomy Of Educational Objectives). 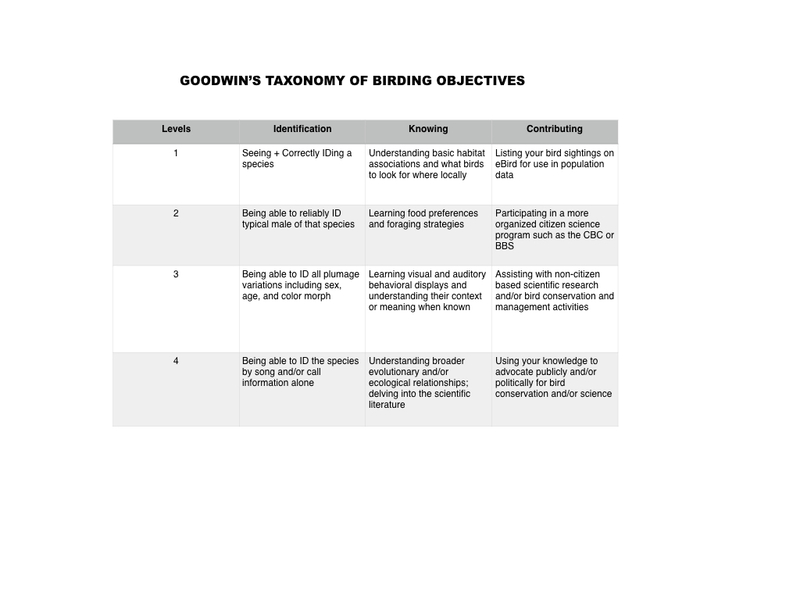 Across the top of the table you'll find general categories of involvement in birding. In general as you move from left to right, there is an increase in the depth of involvement. As you move down the table you'll find tasks within that general category of involvement. As you move down the table the tasks increase in complexity and therefore depth of involvement. Obviously, I could make this more complex and add more levels, but you get the general idea. If you are spending all your time in the left-hand corner of this chart, or even the first row or first column, you aren't getting much depth. It's not necessarily wrong, but I just feel bad for you because you are missing out on all the depth, beauty, and wonder that the hobby of birding has to offer. You are the man!!! Great stuff!! !